With an abundance of walking tracks, deciduous trees, waterfalls and gardens – the Dandenong Ranges are the perfect city escape at this time of year, and an ideal spot for a romantic couples’ getaway. Here is our list of romantic things to do and ideal Dandenong Ranges attractions – all perfect for a daytrip from Melbourne, a weekend escape or even longer! Sometimes the simple things are the most romantic – and at the top of the list is a beautiful bush walk. Thanks to Autumn’s cool mornings and mild days – it is the perfect time to explore outdoors with your partner. You will find walking tracks just waiting to be explored in Melbourne’s Dandenong Ranges. Enjoy the crisp air, the quiet and take in the magnificent surrounds – from lush trees like the towering mountain ash (the tallest flowering tree in the world) to creeks and waterfalls and unique australian fauna such as lyre birds, rosellas and currawongs. The beautiful Dandenong Ranges, perfect for a romantic day trip from Melbourne. There’s something intrinsically romantic about a lookout point and Kalorama Lookout has a view that you won’t forget quickly – providing one of the finest vantage points of the Dandenong Ranges and the surrounding landscape. While you’re there you can also explore the short walking tracks which pass through native forest, historical fruit orchards and exotic plantings. If your idea of a romantic experience includes activewear then Dandenong Ranges attraction the 1,000 Step Walk is the perfect activity. Established in the early 1900s, the 1,000 steps follow a beautiful inclination through the damp fern gully. With filtered sunlight shining through the native trees, it’s a glorious and, yes, a very romantic way to take in the serenity and nature of the Dandenongs. Waterfalls – in all of their grand, majestic and breathtaking beauty – are incredibly romantic. And if you’re looking for things to do in the Dandenongs, then make sure you include a visit to one of the region’s waterfalls. Dandenong Ranges attractions such as Sherbrooke Falls and Olinda Falls are easy to access and make a beautiful spot to enjoy both the sounds and sights of nature – and your present company. If you’re looking to win big brownie points with your partner then why not consider treating your partner to a surprise picnic. Pack the car with a picnic rug, bottle of wine and some antipasto delights and head straight for the Dandenong Ranges. While there is an abundance of beautiful picnic locations to choose from, we suggest either The Dandenong Ranges Botanic Garden (formerly known as National Rhododendron Garden) which is filled with with some of Australia’s rarest flora and fauna. Or the Alfred Nicholas Gardens – located in the sublime Burnham Beeches Estate – known for its picturesque waterfalls and iconic ornamental lake and boathouse. Outdoor bathing in hot mineral springs has got to be one of the best Dandenong Ranges attractions. That’s right – there are beautiful hot springs in Melbourne! 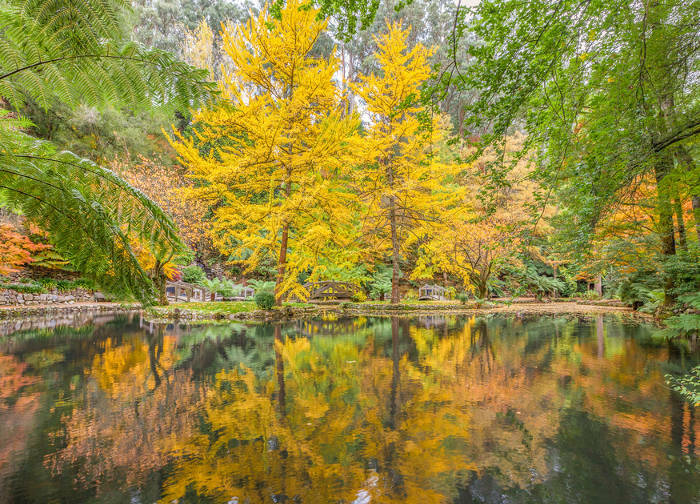 The natural springs in Montrose are one of the most romantic Dandenong Ranges attractions and Autumn is a great time to experience them. Japanese Mountain Retreat hot mineral springs are the only mineral springs in Victoria that offer completely private outdoor hot mineral springs bathing, making them the perfect romantic escape for you and your partner. After you relax in the springs, surrounded by forest and birdlife, you can also combine your experience with a massage or a choice of day spa packages and lunch in the resort restaurant. If you’re looking for a romantic getaway in Melbourne then look no further than Japanese Mountain Retreat Mineral Springs and Spa, located in Montrose. With packages tailored for couples and visitors seeking a luxury spa retreat beyond all expectations, it’s the perfect thing to do, to unwind and relax. Visit for a day or stay in unique Japanese accommodation for a romantic weekend getaway.